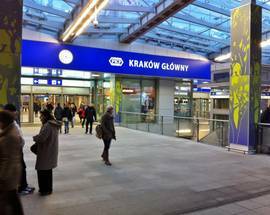 Following a 130 million PLN modernisation project, Kraków Główny - the catch-all title of the city’s vast underground transportation centre - now offers easy transfers between train, bus and tram transport. 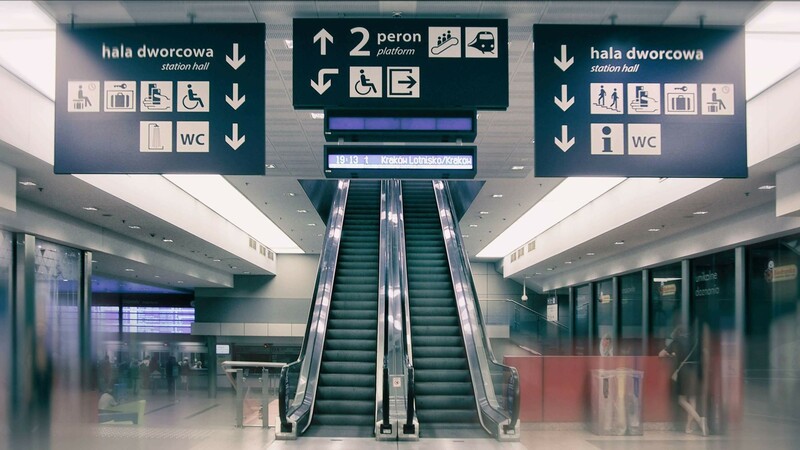 Of course the Galeria Krakowska shopping mall is also cleverly integrated, and along with modern conveniences like waiting rooms, escalators and elevators, you’ll also find plenty of additional consumer opportunities, including cafes, supermarkets, souvenir shops, bookstores and more. 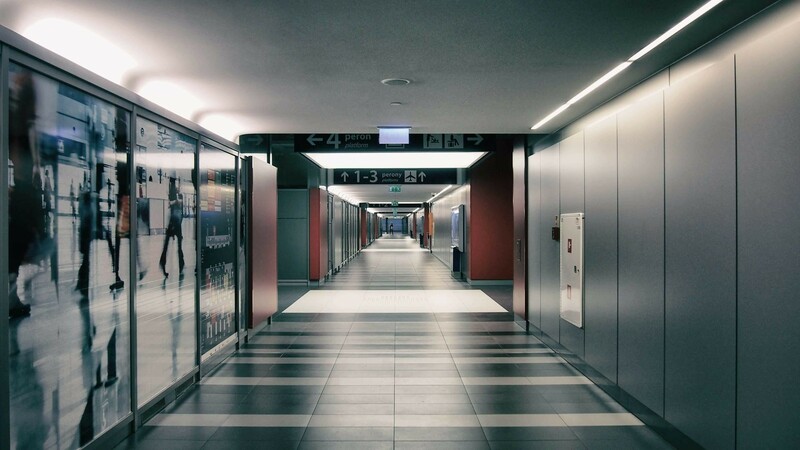 With tunnels, stairs and signs leading off in every direction, it’s all quite confusing (erm, we mean, modern! ), but fear not - IYP will help you sort it out. 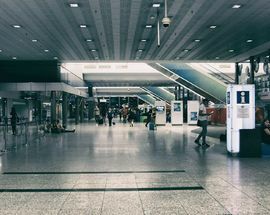 Pretty much everything the modern traveller could ever expect or desire can be found somewhere inside the sprawling, but spiffy facilities of the Kraków train station. In addition to being fully handicap-accessible, there are also special paths for the blind, plus SOS call boxes if you get lost and can’t find your way out for several days. 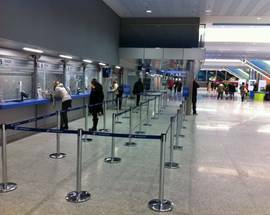 24 ticket windows (some open 24-hours), plus several automated ticket machines (in English) throughout the station limit the possibility of long queues. 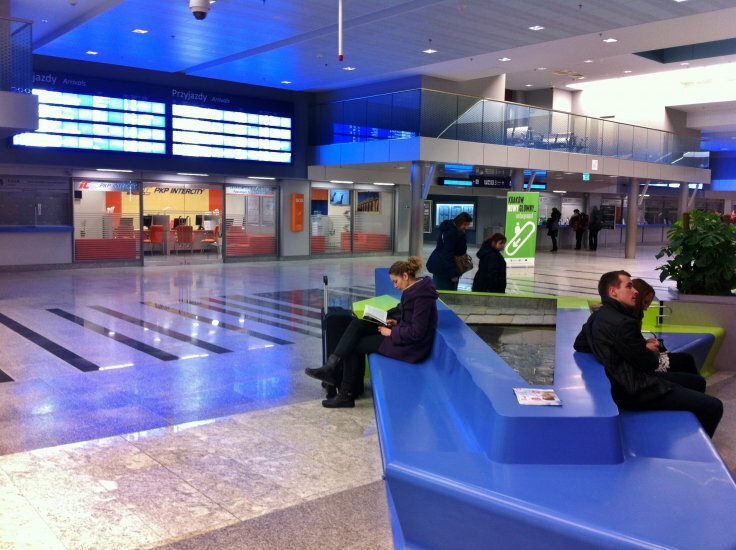 The station is wifi-enabled, there are several waiting areas (including a place for first-class ticket holders to quarantine themselves), a tourist information office (open 07:00 - 22:00), currency exchange, luggage lockers, showers, and dozens of food and refreshment opportunities, not to mention the Galeria Krakowska shopping mall. Conveniently situated at the north-east edge of the Old Town, Kraków Główny is within easy walking distance of most Old Town accommodation, making trams and taxis largely unnecessary. 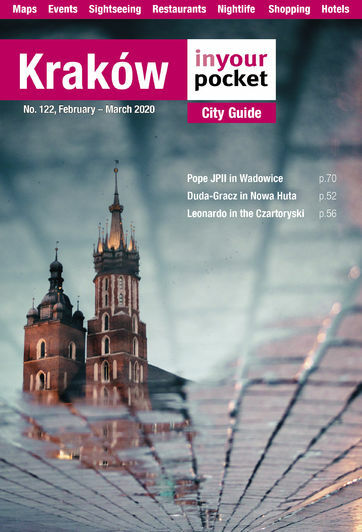 If you’re travelling further than you care to walk, use krakow.jakdojade.pl to navigate yourself there via public transport; you can catch trams to Kazimierz (number 19 in the direction of ‘Borek Fałęcki’ stops at 'Miodowa' in Kazimierz, for example) and other parts of the city by following signs underground to ‘Dworzec Główny Tunel.’ Further tram stops are located just outside the station exits. To skip that trouble however, when you disembark your train immediately head up rather than down from the platform and you’ll find yourself on the top floor parking garage where taxis are waiting to whisk you away. If you opt to walk - and we encourage you to do so, wandering into the Old Town is dreamy - you’ll find that getting out of the station can be a bit of a challenge. There are at least four exits and it’s wise to choose the correct one, based on where you want to go. Following signs to ‘ul. Pawia’ will lead you straight into the Galeria Krakowska shopping mall (in the immortal words of Admiral Ackbar: “It’s a traaap!”). Signs to ‘Dworzec Autobusowy’ or ‘ul. 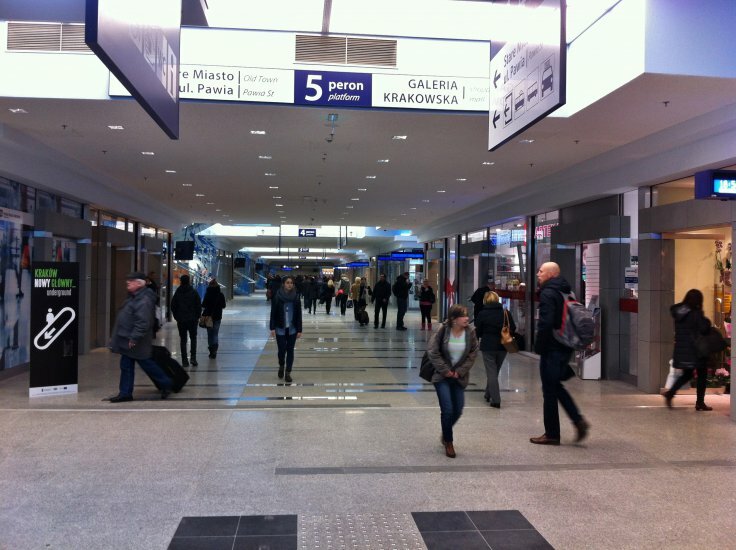 Bosacka’ will put you on the east side of the transport complex (further from the market square). If you want to head straight to the market square (do it, it’s only 10mins away!) 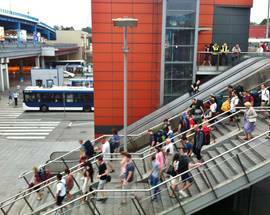 it is easier to take the stairs down from the platforms to the old 'Magda' tunnel, rather than the escalators into the new complex. Once in the tunnel there is a staircase just after platform 1 that will lead you to daylight. If you end up in the main complex, follow the clearly marked signs to ‘Stare Miasto’ (Old Town) or ‘ul. Lubicz’ to escape. Once outside, cross the plaza in front of the old station building (Galeria Krakowska is on your right) to the Andels Hotel and follow the crowds through the underpass; bear right and enjoy a stroll through the Planty Park for two blocks before making a left on Floriańska Street at the Barbican and you’re on the ‘Path of Kings’ to the market square. You’ve arrived. With the train station having been completely moved underground, there’s no longer a clear-cut main entrance, but rather several ways to enter. 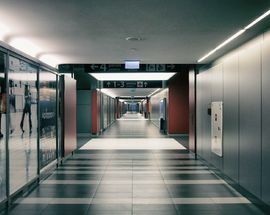 Basically it is directly underneath the train platforms and bus station, so use those as your geographical targets and you’ll find your way; you can also cut through Galeria Krakowska to get there. 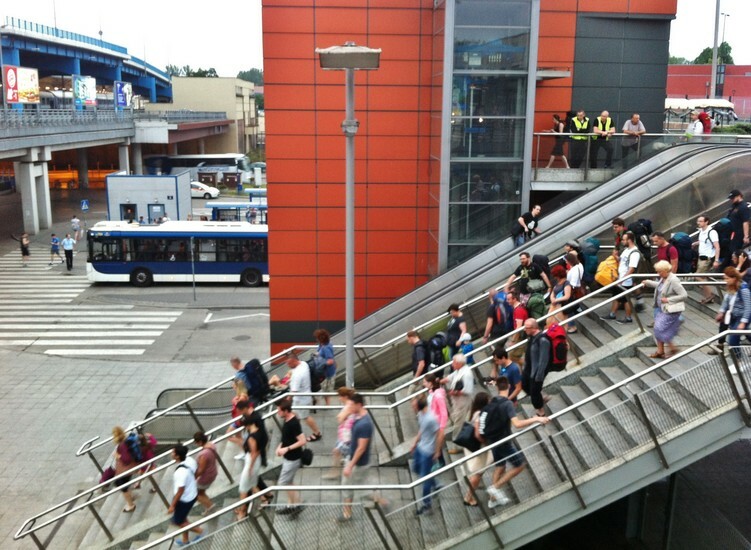 Easily accessed by public transport, there are tram stops all around the train station. Again, your best bet is to have krakow.jakdojade.pl plot your course to the train station from wherever you happen to be in town. If you take the tram or bus to 'Teatr Słowackiego' you will end up somewhere near the intersection of Basztowa/Lubicz and Pawia/Westerplatte streets (there are several stops at this intersection); head through the underpass (if necessary) and across the square in front of Galeria Krakowska to the train platforms. 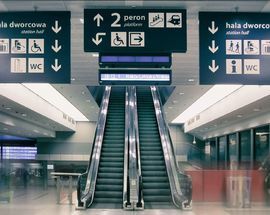 If you take the tram or bus to 'Dworzec Główny Zachód,' enter Galeria Krakowska, descend one level and follow the signs. 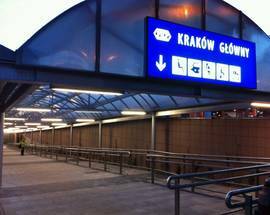 If you take the tram to 'Dworzec Główny Tunel' you are basically already in the underground transport centre - just follow signs to the train platforms. Finally, if you take a tram or bus to 'Dworzec Główny Wschód' navigate yourself through the roundabout toward the buses and you will see the main entrance of the new train station. All of these are perfectly good options, it just depends where you are coming from. Station departures (odjazdy) are listed on yellow timetables, arrivals (przyjazdy) are the white ones; check the timetables online at the Polish railways website - rozklad.pkp.pl - which has limited but effective English language functionality, or try the journey-planning website e-podroznik.pl. If you want a seat on a particular train it is best to book ahead. If in a rush, tickets can also be bought on board the train from the conductor, but expect a surcharge. Open 24hrs. Note that, due to system maintenance, seat reservations cannot be made from 24:00 to 01:00. Hi we are arriving at 2.00pm into the airport. 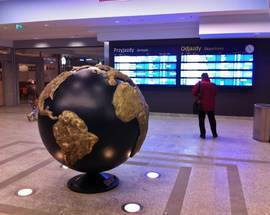 Can we take a train from the airport to Dluga 65? Is it ok to take railway photographs @ Kraków glowny railway station, do I need a permit or not, if I do would you be able to advise me how to obtain one..
We will stay at a hotel on Szlak not too far from the station .There is an elevatoe from the tram station up to street level on Szlak and Waszawska. Which tram do we take to the elevator from the train station or mall? It is one stop. Hi Robert, Płaszów actually isn''t too far from Kazimierz, where your hotel is. To get there, Uber is certainly an option, but so is the tram. It''s only a short 5 stops from the station to the hotel, so we recommend you go for it as a nice way to be introduced to the very charming neighbourhood you''re staying in. 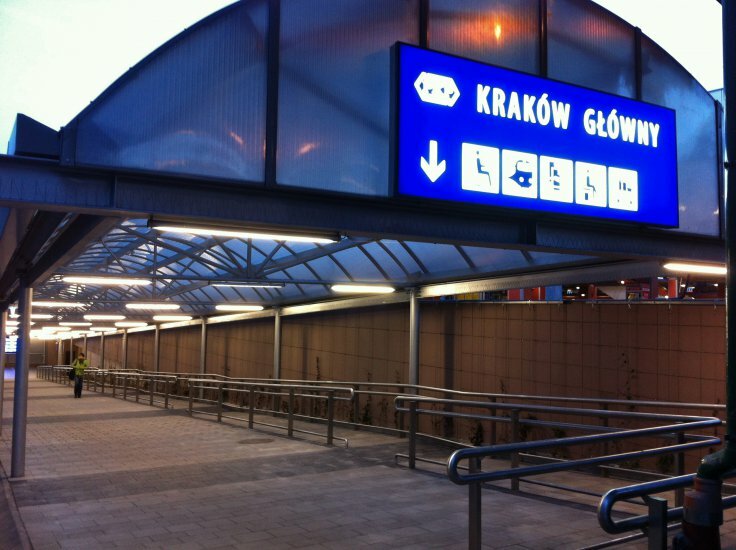 You can get exact, up-to-the-minute public transport info for Kraków from the website krakow.jakdojade.pl, which is what we recommend you and all of our readers to do. This website will plot the exact route for you from Kraków Plaszów to ul. Ciemna. Even is you won''t be able to access it when travelling, you can look at it now and learn the route. It''s very simple. Good luck and enjoy Krakow. 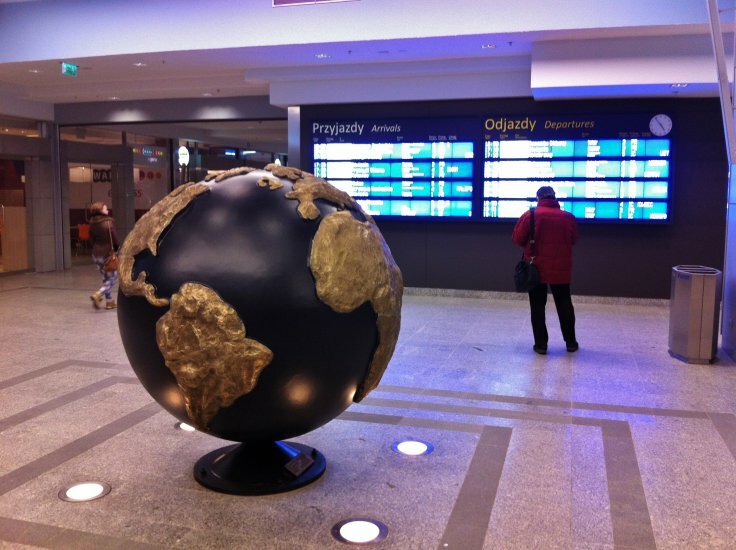 There is also option to use service of luggage storage near Rynek ( Market Square)at Szewska street #20. Hi Maarten, Thanks for your comment. Regarding your inquiry about trains from Wrocław to Kraków on May 15th, we checked ourselves and it does indeed look like something strange is going on there (it''s possible they have track work scheduled or something, who knows?). 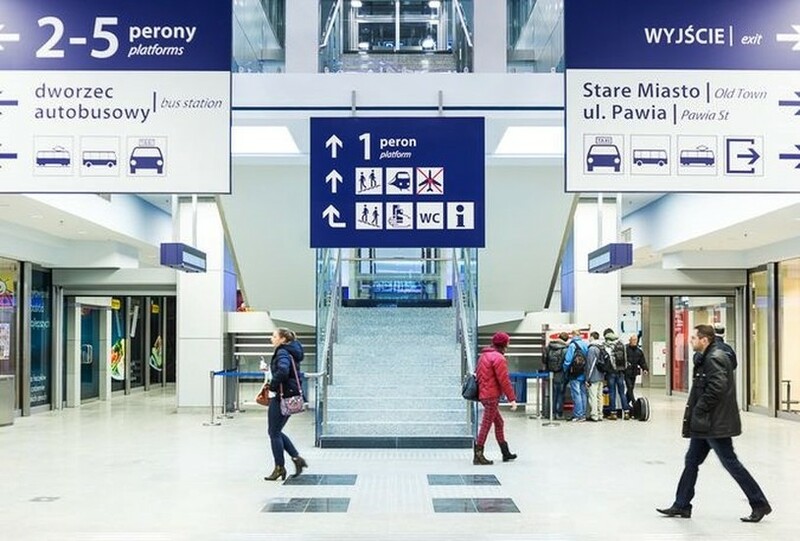 Normally, you should be able to get a direct connection from Wrocław Główny to Kraków Główny (journey time 3hrs 15mins - 3.5 hrs), but on May 15th, it doesn''t look like that''s the case. We didn''t see anything about trains going straight to Kraków Płaszów however; in fact it looks like Kraków Płaszów is even more difficult to get to that day. Where did you get your info? 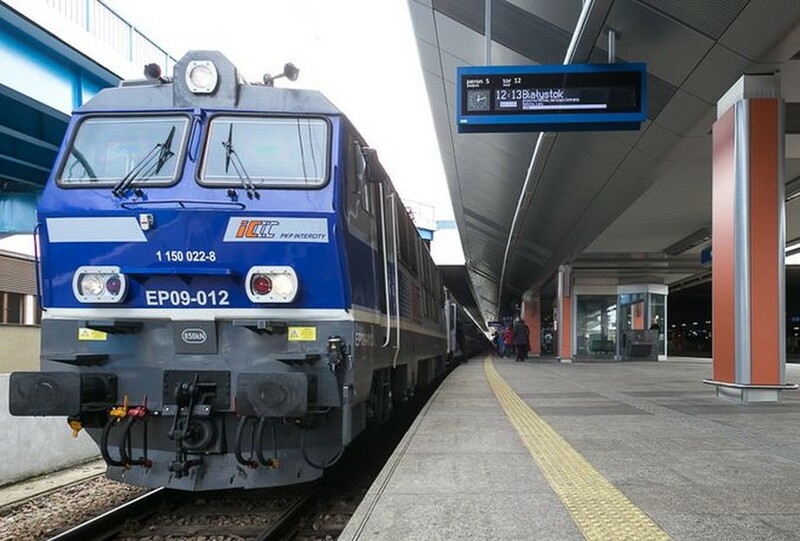 If you go to the Polish Railways website, as far as we can tell, the trains are stopping at Kraków Główny, but there aren''t any direct connections: http://www.rozklad-pkp.pl/en Make sure you have Wrocław Głowny and Kraków Główny - the main stations - as your arrival and destinations points. From the results we got, the only sensible option seems to be the 12:47 train, unless you really want to have an all day rural train adventure. Unfortunately, even that option isn''t perfect, because it dumps you in Batowice (northeast of the centre) for 30mins. 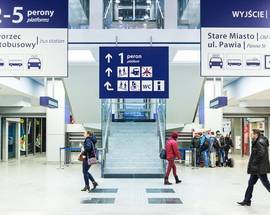 You could try local buses (this could be challenging) or a cab from Batowice to wherever you''re going, but it honestly might be simpler to just wait for the train. ​ You can buy a ticket right there on the PKP website if you''re so inclined, and you might want to do that soon since it looks like it will be a popular (very full) train on that day. 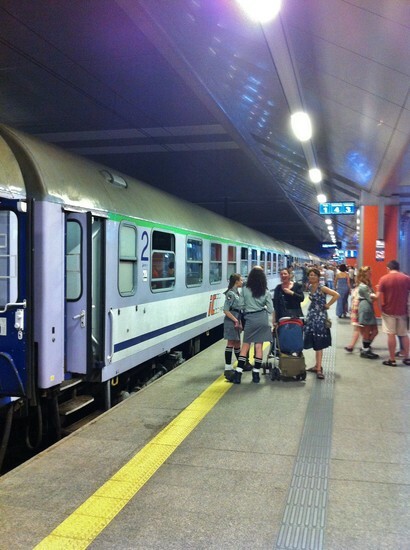 Alternatively, forget the train and check out Polski Bus (polskibus.com) to get there efficiently by bus, with perhaps a few more options for the departure time. Hope this helps. Let us know how you fare and if you have any more questions. And thanks for reading In Your Pocket. I''m planning a short railway trip in May and I noticed trains from Wroclaw to Krakow during daytime on May 15th are ending on Plaszow station instead of Glowny station. What''s the best way to get in the center? 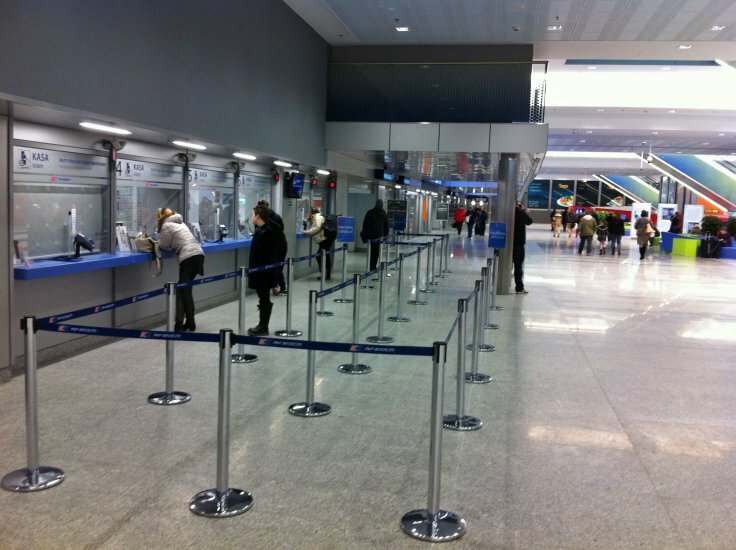 Are tickets available at Plaszow station? Hi Johana, If you are staying near the market square, chances are you can easily walk there from the train station. It is only 10mins from the station to the market square on foot. If you read the full text here (page 2) you''ll find specific directions on getting from the train station to the market square. IRCTC provided facility to confirm Seat Availability in Train if you have booked tickets for traveling. Hi, We are planning a journey from Bratislava,Slovakia to Krakow, Poland in May 2015. I found a overnight sleeper from Bratislava to Krakow with Slovikian railways. However If I try to book the information is not showing up in their website. 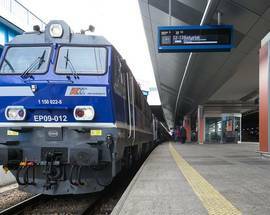 Do you have a direct overnight sleeper in Polish railway? 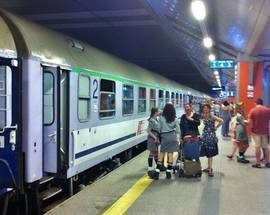 And how can travel from Krakow to Warsaw by train? 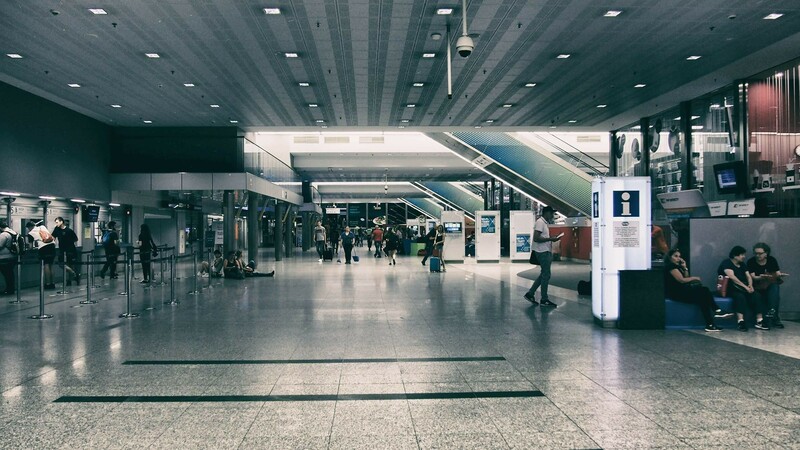 This station is a main station for arrival from Bratislava and departing to Warsaw? Would anyone be able to tell me what specific train/bus/tram to get that would take me to Petrus hotel? To Johan: Every train to/from every major city leaves and departs from here. 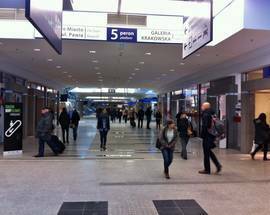 Krakow does not have any other satellite or suburban train stations that travellers need to keep in mind. Everything goes through Krak&#243;w G&#322;&#243;wny. Do the sleepers to Warschau and Gdansk also depart from here ? To Jennifer: Yes, of course it is. You can do it at any ticket window. Is it possible to book the overnight train to Prague at the station, we are unable to book online as we are due to travel on Sunday?? To Paul: Yes, and yes. There are showers in the station, and outlets throughout where you can charge your phone if you have a charger. Are there any public showers in the new station? Also, anywhere to charge phones? Hi Breda, NO! The train line is not running from February 1st, and according to our sources will be closed for at least a year! Apparently this is within the authorities interpretation of &#34;not affecting the normal operation of the airport.&#34; We recommend taking the bus.